Parker Johnstone was the driver of this Kool Reynard Honda #27 Indy Car, for Barry Green team. These were the first models we built in this very distinctive colour scheme, and this Limited Edition build, was commissioned by "Brown & Williamson's ", the tobacco company who sponsored the Kool cars. The Swift 008.a Toyota Atlantic car, was into it's second year. Alex Gurney was the driver of that #27 car, being fielded by Barry Green, in the Kool Toyota Atlantic Championship series. 1/10th. scale models of this car were commissioned by Brown & Williamson's Tobacco for presentations, at the end of that year. 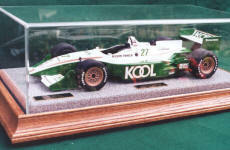 Paul Tracy and Dario Franchitti joined Team Kool Green in the #26 and #27 cars in 1998. They were together each year until Brown & Williamson's sponsorship was terminated, due to the change in the Tobacco laws. Team KOOL Green's sponsorship terminated at the end of 2001.